The Tiaras 4 Dance online store was launched in January 2009 with a beautiful range of handmade crystal tiaras, bun tiaras and headpieces for dancers of all ages. The crystal range uses the finest quality Swarovski Crystal, Czech Fire Polished Crystal Beads, shiny glass pearls and silver plated wiring in gold or silver. Tiaras 4 Dance also offers a crystal alternative in glass on most of our designs of tiaras and headpieces to cater for the needs of dance schools looking for a lower cost option for large troupes performing at eisteddfods and concerts. 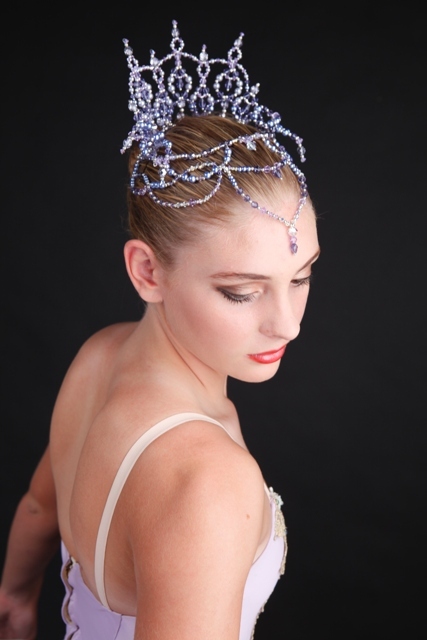 In 2012 Tiaras 4 Dance began designing a beautiful range of repertoire headpieces. This range of tiaras and crowns as specifically designed to be worn for some of the more popular ballets eg La Bayadere, Sleeping Beauty, Swan Lake, Nutcracker and Coppelia. Tiaras 4 Dance will continue to develop this range over 2012/13. - All of the designs are available in the full range of colours and colour combinations to suit the dancers costuming. Customised Service - A fully customisable service is offered by Tiaras 4 Dance. Use the Contact Us link to send through details of colour, size and quantity as well as your ideas for design. Tiaras 4 Dance will contact you to discuss the design in more detail and provide a quotation. Customer Service - Tiaras 4 Dance strives to bring our customers the very best in service, design and quality world wide. We are firmly committed to customer satisfaction and if you are not absolutely delighted with your purchase from Tiaras 4 Dance we offer a full money back guarantee. By constantly coming up with new designs and negotiating better pricing with our suppliers, we are able to bring you affordable, customisable headpieces that you will treasure for ever.